The annual scramble to prevent next year’s scheduled pay cut for doctors who treat Medicare patients kicked off Thursday with physician leaders calling for a five-year program of guaranteed annual raises and a high-ranking Republican calling for another short-term fix. The issue – known inside the Beltway as “the doc fix” – is the residue of a law enacted by Congress in the late 1990s that sought to limit the growth of Medicare spending. The law limited physician pay increases to same growth as the overall economy, which became known as the sustainable growth rate or SGR. Since health care spending over the last decade grew twice as fast as gross domestic product, implementing the SGR would dramatically shrink physician pay as a share of overall Medicare spending. It never happened. Every year members of the American Medical Association and specialty societies bombard Capitol Hill with demands to restore the old system. And every year, Congress voids the SGR-mandated cuts. But that means that every year the size of the scheduled pay cut under the original law grows larger. 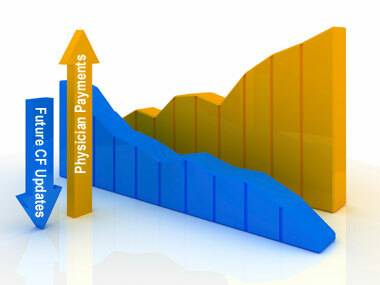 Unless Congress acts before January 1, physician pay next year will be reduced by 29.4 percent. The estimated 10-year cost for the “doc fix,” according to the Congressional Budget Office, is approaching $300 billion. But even a short-term fix would cost tens of billions of dollars next year, which could wipe out a significant portion of the budget reductions that Republicans are seeking as part of the debt-ceiling negotiations that kicked off yesterday. Legislators looking for a magic bullet to the physician pay issue received no help from physician lobbying groups who testified on Capitol Hill Thursday. At a hearing of the House Energy and Commerce subcommittee on health, the American Medical Association called for scrapping the SGR and instituting a five-year program of regularly scheduled pay increases, during which time the Centers for Medicaid and Medicare Services (CMS) could experiment with alternative payment models like bundled payments or special reimbursements for coordinating care. The American Academy of Family Physicians, which represents relatively low-paid primary care physicians, called for higher reimbursement rates for their specialty. The American College of Surgeons, which represents some of the highest paid specialists and would be hurt by a shift in pay toward primary care, also called for SGR’s repeal and setting a “realistic” budget baseline for future payment increases for all specialties, which should reflect the actual cost of providing care. Mark McClellan, who headed CMS during the George W. Bush administration and now heads the Brookings Institution’s health care policy shop, told the subcommittee that “the payment reforms in the Affordable Care Act are a foundation for this.” That was an ironic statement coming from a former high-ranking Republican official, since the House majority, in a vote taken earlier this year, repealed the ACA. The special interest scramble to leads Congress to ditch the SGR every year provides a cautionary tale on strategies for reining in Medicare costs that have been coming from both sides of the aisle. The Democrats’ health care reform legislation achieves a half trillion dollars in Medicare savings over the next decade largely by putting a ceiling on the program’s annual growth rate that is one percentage point faster than GDP. President Obama, in his deficit reduction plan announced last month, upped the ante by calling for a ceiling growth rate of GDP plus 0.5 percentage point. The vehicle for achieving these savings in either case will be the reform law’s new Independent Payments Advisory Board, which starting in 2015 is scheduled to send mandatory cuts to Capitol Hill whenever health care grew faster than the target rate. Congress could either approve those cuts, or substitute a package of its own that achieved similar savings. Camp attacked that approach yesterday, saying it was unacceptable for “a bunch of unelected bureaucrats” to dictate cuts that “will only cut payments to providers.” But the Republican plan for lowering Medicare’s unsustainable growth, which is called premium support because it would give future seniors a voucher to buy private insurance, has a cap of its own. Its pegs the growth in the government’s annual contribution to premium support payments to a formula that is one percentage point higher than the consumer price index, which in most years is well below the growth in the economy. It goes without saying that any such formula could be thrown out the window by future Congresses – just as the SGR will be when Congress passes its next “doc fix” sometime before next January.